Different idea and so adorable. Love the personalization. You could really use any little doll pattern and add a tooth pocket. and the little bow. Too cute! A little pocket on the back holds the tooth. some ribbon so that it can be hung from a doorknob or headboard. on the front for the actual baby tooth, and the tooth fairy leaves the loot in the bag. for the recipient. Check out Larissa's Tooth Officer version for a boy. I mentioned last week that I have a thing for matryoshka dolls. I love this idea, and there is a printable pattern available for this pillow. Lots of inspiration. I may be combining my favorite elements from each of these into the tooth fairy pillow that I actually end up creating. Lots to think about... at least I have a while to figure it out! Did you have a tooth fairy pillow as a child? Do you remember what it looked like? Interested in seeing the other kid-related pins on my Pinterest For the Kids board? Click HERE. Interested in seeing ALL of my Pinterest boards? Click HERE. No clue what Pinterest is? Click HERE. 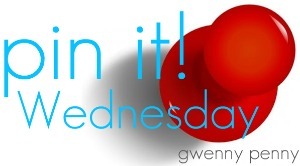 Fun ideas Gwen. I especially like the Purl Bee's like bags - they are adorable! This is a fab selection! This is where I would get my little one to pick his favourite so I wouldn't have to choose. They're all so sweet! Great round-up! Aaaaah! These are so cute!! And just what I need for our children!! At the moment we use a tim - not very comfy in bed!! These are so fun! I never had one as a kid... not even sure we had a tooth fairy at our house when I was a kid... but I want one for my kids. You know, in another 4 years when they maybe start losing teeth. We never had a tooth fairy pillow..we had to put our tooth in a glass of water on the windowsill in the kitchen and in the morning there would be money in the water and no tooth! I kept some of my kids baby teeth but eventually they went a bit weird and yellow and I tossed them. 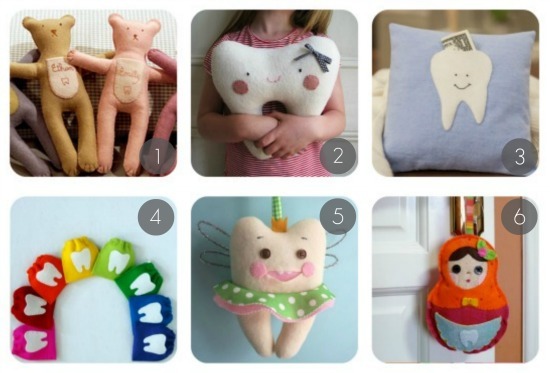 Larissa's fun tooth fairy pillow was one of the first things I found after I discovered craft blogging. I even downloaded the pattern, but have yet to make one. I can't wait to see what you come up with!